Pallet racks create order and optimize storage space in warehouses and other facilities, making effective use of available storage space and ceiling height. Basic pallet rack consists of upright steel frames connected by horizontal beams; pallets rest on the beams between the frames. Two frames and the corresponding beams form a “bay” of rack. Pallet load height and the amount of vertical space available determine how many pallet positions can fit in a bay of rack. CSI sells product from a large number of manufacturers, in the event you have standardized on a specific rack manufacturer's product: Speedrack, Steel King, Frazier, Hannibal, Konstant, West Point Rack (Cantilever), Ridg-U-Rak, Mecalux, Interlake, and Unarco. Contact Us for any of your pallet racking needs. CSI can provide you quick availability to New inventory regarding the following four manufacturers: Speedrack, Steel King, Interlake, and Ridg-U-Rak. Contact Us when you need pallet rack quick. Our USED Inventory is constantly in flux based upon what we bring in and what is moving out the door. Contact Us regarding your used pallet racking needs. We offer new pallet racking products, as well as used. 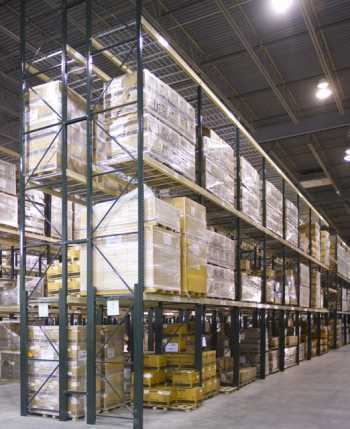 When determining your pallet racking requirements consider wire decks for odd shaped items, items not on a pallet, safety and fire suppression considerations. If you’re unsure of which pallet rack wire decking system is right for your needs, we can help. The Container Systems team will work with you to develop a solution that promotes effective warehouse logistics and maximizes your facility’s safety, security, and available space. We also offer complete installation services for all our pallet rack systems. Request a quote today on used or new pallet racking for your facility, or contact Container Systems for more information.